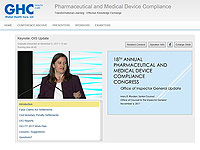 The Nineteenth Annual Pharma Congress conference content is now available in a variety of formats. You may purchase the Congress streaming content in the following formats: Flash Drive or online archive (6 months). Online Archive of the Nineteenth Annual Pharma Congress Presentations! Flash Drive of the Nineteenth Annual Pharma Congress Presentations! The Pharmaceutical Compliance Forum (PCF) is a coalition of compliance professionals including compliance officers and senior legal counsels from 70+ distinguished researched-based pharmaceutical manufacturers and biotech companies. The PCF was founded in early-1999 by compliance professionals from the pharmaceutical industry to promote effect corporate compliance programs.